Americas gateway to the universe. Leading the world in preparing and launching missions to Earth and beyond.Jan. 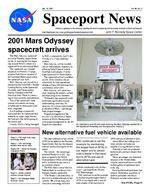 19, 2001 John F. Kennedy Space Center Spaceport Newshttp://www-pao.ksc.nasa.gov/kscpao/snews/snewstoc.htmVol. 40, No. 2 Page 5  ELV Manager Bobby Bruckner retires. Page 2  KSC technology benefits other launch sites. Pages 3-4  Inside the Payload Changeout Room. InsidePage 2  KSC team wins major technology award. Page 5  Goldin contacts workers through Internet.New alternative fuel vehicle available2001 Mars Odyssey spacecraft arrivesThe latest alternative fuel vehicle (AFV) to be added to the Kennedy Space Center fleet has the cleanest internal combustion engine on the planet. The vehicle  the natural-gaspowered Honda Civic GX  has been assigned to the NASA Transportation Office vehicle pool and is available to sign out as a government vehicle. The KSC fleet is one of the first Federal fleets to use the environmentally friendly automobile. The Honda is the latest entry in the list of available alternative fuel vehicles. We will see many new innovative and energy-efficient vehicles introduced in this millennium, said Janet Keith, NASA/ KSC Fleet manager. KSC continues to set the example by maintaining the largest fleet of AFVs in our region and is considered a leader in the transition to AFVs and use of alternative fuels. About 300 of the 2,000 government vehicles on Center are capable of using alternative fuels. Alternative fuels are produced domestically and burn cleaner than gasoline. Those advantages are important because in the United States vehicles and aircraft burn over 400 million gallons of petroleum fuels every day. Burning that much petroleum fuel releases tremendous quantities of harmful pollutants into the air. Pollutants include carbon monoxThe Mars Odyssey spacecraft arrived at Kennedy Space Center on Jan. 4, marking the first major step toward NASAs return of a spacecraft to an orbit around Mars. The spacecraft was shipped aboard an Air Force C-17 cargo airplane from Denver, location of the Lockheed Martin plant where the spacecraft was built. Mars Odyssey was moved on a transport trailer from KSCs Shuttle Landing Facility to the Spacecraft Assembly and Encapsulation Facility 2 located in the KSC Industrial Area. There it is receiving its final assembly and checkout. Two of the spacecrafts three science instruments are being installed and its three-panel solar array integrated. It will undergo a spacecraft functional test, be fueled and then mated to an upper stage booster, the final activities before going to the launch pad. Launch, which is being managed by KSC, is planned for April 7, the first day of a 21-day planetary window. Mars Odyssey will be inserted into an interplanetary trajectory by a Boeing Delta II launch vehicle from Pad A at Complex 17 at the Cape Canaveral Air Force Station. The spacecraft will arrive at Mars on Oct. 20 for insertion into an initial orbit. Its final operational altitude will be a 250-mile-high Sunsynchronous polar orbit. Mars Odyssey will spend two years mapping the planets surface and measuring its environment. Ultimately the spacecraft could contribute significantly toward understanding what may be necessary for a more sophisticated exploration of Mars, said George Pace, project manager. Program management of the mission is by the Office of Space Science at NASA Headquarters with project management by the Jet Propulsion Laboratory. (See FUEL, Page 6) KSC continues to set the example by maintaining the largest fleet of AFVs in our region and is considered a leader in the transition to AFVs and use of alternative fuels.An overhead crane lifts the crate covering the Mars Odyssey spacecraft in the Spacecraft Assembly and Encapsulation Facility 2. SPACEPORT NEWSPage 3 Jan. 19, 2001Insidethe Payload Changeout RoomThe Payload Changeout Room (PCR) at each pad at Kennedy Space Center is a 70-foot high clean room used to transfer vertical payloads into the cargo bay of the Shuttle. The PCR is part of the pads Rotating Service Structure (RSS) and features a massive, multiplatform hydraulic lift, the Payload Ground Handling Mechnism (PGHM). Although the PGHM advances over a length of rails during transfers, those rails do not bear the PGHMs weight. The PGHM actually hangs from beams near the PCR ceiling. Payloads  brought from the Vertical Processing Facility  are offloaded from a payload canister to the PCR by a team of 20 to 40 United Space Alliance technicians and engineers using the PGHM when the RSS is in the park position. The Rotating Service Structure then rotates to embrace the Shuttle and the payload is transferred by the team via the PGHM into the cargo bay. Most recently the PCR was used to transfer the 28-foot long U.S. Laboratory Destiny into Atlantis. About 20 technicians accomplished the transfer of the 32,000-pound payload over several days through a complex series of maneuvers, many of which were slow and tedious to perform correctly. The closer you get to linking the PGHM to the payload or the payload to the orbiter, the slower you have to go, said Don Lovelace, Pad A PCR/Environmental Control System operations manager for USA. We have to be very careful not to damage either. Before the transfer begins, the payload is loaded into a canister in the Vertical Processing Facility and taken to the pad on the payload canister transporter. The canister is then lifted to mate with the PCR. After the canister doors are open, the PGHM is moved forward in the PCR 30 feet toward the payload. The team of technicians on the PGHM then deploy wing platforms and PGHM ladders so they can better access the payload from the PGHM. The PGHM is then moved forward about 10 feet to about 10 inches from the trunnions, large pins used to hold the payload in place. In that position, the PGHM front end is finely adjusted in the three dimensions so that the PGHM support fittings, J-hooks, can be attached to the payload trunnions. Those adjustments take hours. After adjustments are completed, the J-hooks are attached to the trunnions and the weight of the payload transferred by slightly lifting the Jhooks. The payload is removed from the canister and the PGHM is backed up in a similar fashion to its approach. The canister is lowered and taken away. After the orbiter is in place at the pad, the RSS is rotated to mate the PCR with the cargo bay. The PGHM, carrying the payload, is maneuvered in a similar manner as when it linked up with the payload except this time the goal is linking the payload trunnions with the latches in the orbiter cargo bay. The transfer of Destiny was considered relatively easy, Lovelace said, because only one payload was moved. Depending upon the number of payloads to be transferred (up to five) per Shuttle mission, the transfer operation can require up to about 40 team members. Payload transfer task team members are pulled from various shops at both pads, including Liquid Oxygen and Liquid Hydrogen 2, Hypergolics/PRSD, Swing Arms, Ground Support Equipment Electrical, and Environmental Control Systems. Thoroughly training new technicians in payload transfer operations takes about two years. The entire task team is extremely committed to professional excellence during all payload transfer operations, Lovelace said. We strive to perform our tasks to the highest standards in keeping with USA and NASA expectations of the entire KSC team.  The closer you get to linking the PGHM to the payload or the payload to the orbiter, the slower you have to go. We have to be very careful not to damage either. Don Lovelace Pad A PCR/Environmental Control System Operations ManagerThe payload canister is lifted to mate with the Payload Changeout Room in the Rotating Service Structure at Pad A. Page 4SPACEPORT NEWSJan. 19, 2001 Above, United Space Alliance engineer Chrystal Jolly reviews procedures with technician Dave Waters. At left, engineer Pete Reutt directs technician Melanie Melancon on the J-Hook Control Console. Above, United Space Alliance technicians Robert Stitt (standing) and Sal Mezzatesta observe clearances between the orbiter and Destiny. At left, Stitt and Mezzatesta perform J-Hook operations. At far left, task team members conduct preoperations for payload transfer. An Orbiter Integrity Clerk monitors personnel and equipment entering and departing the PCR. SPACEPORT NEWS Jan. 19, 2001 Page 5 ELV Program Manager Bruckner retiresBobby Bruckner, manager of the Expendable Launch Vehicles (ELV) and Payload Carriers Programs at Kennedy Space Center, retired from NASA on Jan. 3 after 35 years of federal service. Bruckner was responsible for acquisition of ELV launch services to satisfy all of NASAs requirements for ELV launches. He successfully consolidated the ELV Program from several NASA Centers to a single location at KSC. The ELV organization he managed performs analyses of advanced missions, which allow mission managers to select launch vehicles appropriate to the specific mission needs. The program also performs NASA payload-to-launch vehicle integration, payload processing support, launch vehicle processing oversight, and launch countdown management. Bruckners responsibilities extended from KSC to NASA launches at Vandenberg Air Force Base, and planned launches from Alaska and Kwajalein Island. As the manager of the Payload Carriers Program, Bruckner was responsible for maintaining a fleet of reliable and cost-effective payload carriers for payloads that fly on the Space Shuttle. The Payload Carriers organization supports advanced payload planning by contributing new payload carrier designs and by reducing the cycle time from payload inception to launch. Previously Bruckner served as director of Payload Processing. In that position, he managed the processing of Shuttle and ELV payloads at KSC, planning for Space Station processing at KSC, and ELV launch management. Before that he was director, Payload Ground Systems. Bruckner joined NASA in June 1966 at Kennedy Space Center where he worked as an electrical engineer developing telemetry and data display systems used in the test and checkout of Apollo/Saturn launch vehicles. William Williams and Coleman Bryan recently announced their retirement from NASA and their positions in the Spaceport Engineering and Technology Directorate at Kennedy Space Center. Both had careers spanning the Apollo, Skylab, Apollo-Soyuz andTwo SE&T managers retire from NASASpace Shuttle human space flight programs. Bryan, chief, Physical Test and Analysis Branch, gave 32 years of federal service with NASA at KSC. His scientific contributions, especially in the area of oxygen compatibility and hazard characterization, helped KSC achieve a high safety standard. Bryan also was a leader in standards and methods for chemistry in the American Society for Testing and Materials. Williams, Commercialization manager for the directorate, gave more than 34 years of federal service, including 33 years with NASA at KSC. Williams contributions to the KSC Technology Development and Technology Commercialization programs enabled KSC to achieve many significant milestones associated with those programs.Goldin contacts workers through InternetBobby BrucknerNASA Administrator Dan Goldin communicated his views on the NASA Integrated Action Team report to space program employees agencywide Jan. 11 through a highquality webcast that was a first of its kind for the agency. NASA Chief Engineer Brian Keegan was also featured in the webcast, which included a 20minute taped introduction to the report by Goldin and Keegan and a live question-and-answer session. Viewers from various centers were able to submit questions via e-mail. The NIAT report is the result of efforts started in March by Keegan to develop an integrated plan addressing recommendations from reports on the Mars program, space shuttle wiring issues and a generic assessment of NASAs Faster, Better, Cheaper practices. The report recommends a series of actions for more effective management of the agencys many complex engineering projects. The reports recommendations are broken into the following themes: Developing and Supporting Exceptional People and Teams Delivering Advanced Technology Understanding and Controlling Risk Ensuring Formulation Rigor and Implementation Discipline Improving Communication The webcast was open to employees agencywide via desktop computers or computer-equipped conference rooms. At KSC, 68 computers were used to access the webcast. About 100 people watched the webcast from KSC conference rooms. The webcast event was not highly publicized because of the experimental nature of the communication. NASAs Spaceport Engineering and Technology Directorates Internet Systems Lab provided technical support for the web multicast at KSC. The webcast was considered a technical challenge for the agency because it was fed to all the centers at the same time. In addition, a much faster frame rate and higher resolu-tion was used than in typical NASA webcasts so that visual and sound clarity would be closer to that provided by television. The use of webcast rather than television as the forum to discuss the NIAT report was a calculated step by Mr. Goldin to promote the use of technology within NASA. This was the first use of this technology by the administrator to communicate across the Agency, and by all measures it was a resounding success, said Richard Sharum, NASA KSC technical lead for the event. Keegan said the communication was a pilot project and that future agencywide webcasts will likely follow. Goldin asked that all employees in related programs read the NIAT report and that supervisors take the time to meet with employees to discuss the reports implications for improving work processes. The NAIT report and more information about the webcast can be accessed directly at https:// webcasts.hq.nasa.gov/niat/ Goldin asked that all employees in related programs read the NASA Integrated Action Team report and that supervisors take the time to meet with employees to discuss the reports  implications for improving work processes. John F. Kennedy Space Center Managing editor. . . . . . . . . . . . . . . . . Bruce Buckingham Editor. . . . . . . . . . . . . . . . . . . . . . . . . . Kathy Hagood Editorial support provided by InDyne Inc. Writers Group. NASA at KSC is located on the Internet at http://www.ksc.nasa.govUSGPO: 633-096/00049Spaceport News Spaceport News is an official publication of the Kennedy Space Center and is published on alternate Fridays by the Public Affairs Office in the interest of KSC civil service and contractor employees. Contributions are welcome and should be submitted two weeks before publication to the Media Services Branch, XAE-1. E-mail submissions can be sent to Katharine.Hagood-1@ksc.nasa.gov Page 6SPACEPORT NEWS Jan. 19, 2001FUEL ...(Continued from Page 1)The system will be based on CMU technology and the Command and Control Toolkit package augmented with the newly released T-Zero launch control software. Another major milestone for the commercial use of the CMU technology came in December when CCT announced it had made final delivery of spaceport operations software and computer systems at the Kodiak Launch Complex in Alaska. Just a few months earlier, in September, the NASA launch facility in Wallops Island, Va., ordered CMU-based software for testing to determine if the software is now suitable for the high launch rates supported at their site. More benefits of the CMUtechnology are to come, said Craig Jacobson, NASA project manager, Future Missions and International Partner Division. The CCT products are also in use developing concepts for the next generation tools for payload processing at KSC and customer sites, Jacobson said. The broad applicability and configuration flexibility are key concepts for new approaches to future tools.SOFTWARE ...(Continued from Page 2) ide, sulfur dioxide, ozone, particulate matter and nitrogen oxides. The EPA and American Lung Association have determined that these pollutants damage our lungs and degrade the environment. But thats not the only reason to lessen our use of petroleum fuels. The United States imports about 52 percent of the petroleum it uses, much more than during the 70s energy crisis. This position makes the U.S. economy highly susceptible to the policies of foreign oil-producing countries. The economy has suffered several surges in gasoline prices in recent years. To alleviate these problems, communities across the nation are working to make AFVs commonplace by participating in the Department of Energys Clean Cities program. Regional Clean Cities Coalitions bring together vehicle fleet operators, vehicle manufacturers, fuel providers, public citizens and representatives from all levels of government to allow a coordinated effort in the transition to AFVs. Right now, cars, trucks and vans from Ford, GM, DaimlerChrysler, Honda and others are available in versions that can burn alternative fuels, such as natural gas, ethanol or propane instead of gasoline. But there are obstacles to widespread use of AFVs. Consumers ask such questions as Why buy an AFV if refueling stations are scarce? and Why put in stations if AFVs are scarce? Here in Central Florida the Space Coast Clean Cities Coalition is working to establish refueling stations near resident AFVs and along major travel corridors in its nine-county region. KSC supports the states AFV initiatives through a reimbursable agreement that allows Florida Department of Transportation vehicles to refuel at the KSC compressed natural gas fueling station. KSC also supports the Space Coast Clean Cities Coalition. Current efforts by the coalition include the opening of a compressed natural gas station in Titusville, grant proposals for additional stations in Melbourne, Deland and Debary, as well as ethanol refueling at KSC. For additional information on AFV developments here at KSC, or participating in Clean Cities, contact Hien Nguyen, 7-8455 or Dave Koval, 7-8189.One of about 300 of the 2,000 government vehicles on Center that are capable of using alternative fuels.The Kennedy Space Center fleet is one of the first federal fleets to use the natural-gas-powered Honda Civic GX, pictured above.The car has been assigned to the NASA Transportation Office pool and is available to sign out.